Paris is burning. Can Jack Morgan douse the flames? 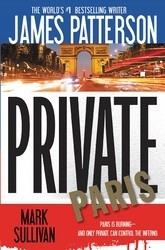 When Jack Morgan stops by his investigation firm Private's Paris office, he envisions a quick hello during an otherwise relaxing trip filled with fine food and sightseeing. But Jack is quickly pressed into duty after he receives a call from his client Sherman Wilkerson asking Jack to track down his young granddaughter, who is on the run from a brutal drug dealer. Before Jack can locate her, several members of France's cultural elite are found deadï¿½murdered in stunning, symbolic fashion. The only link between the crimes is a mysterious graffiti tag. As religious and ethnic tensions simmer in the City of Lights, only Jack and his Private team can connect the dots before the smoldering powder keg explodes.